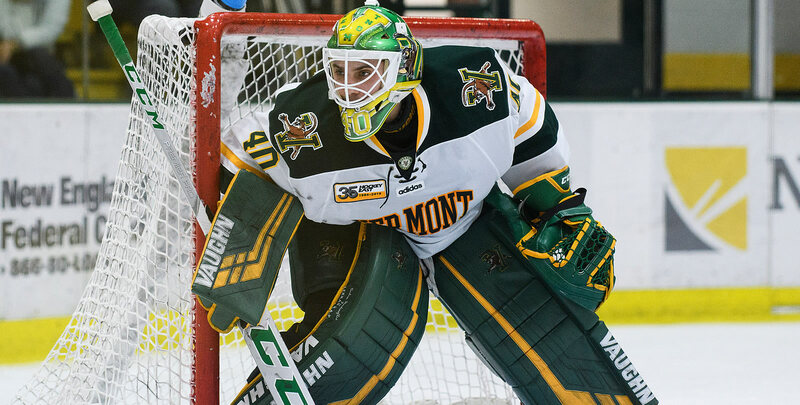 Vermont took three of four points from #9 Providence at Schneider Arena over the weekend. Stefanos Lekkas (Elburn, Ill.) made 33 saves in the Catamounts' 3-1 win on Friday before coming back with a 46-save effort in Saturday's 1-1 draw with the Friars. He finished the weekend with 79 saves, a 0.98 goals against average and .975 save percentage in the two wins and earned Hockey East Player of the Week for his efforts. UMass Lowell extended its winning streak to eight games (7-0-1) with a 3-1 win at #12 Northeastern. The victory was the River Hawks' its eighth consecutive road win, the most for the program since 2013. The 11 road victories on the year for UMass Lowell are the most in the nation. Massachusetts won its 20th game of the season with a 7-5 victory at Boston University on Friday night, marking just the third time in program history the Minutemen have reached the 20-win plateau. Rookie Ty Farmer (O'Fallon, Mo.) registered the first multi-goal game of his career, including the game-winning tally to lead UMass to its first road win over BU since 2012. Maine and New Hampshire split a weekend series in Durham, thanks in part to a five-point weekend from the Black Bears' Mitchell Fossier (Alpharetta, Ga./2g, 3a) and 72 total saves from Jeremy Swayman (Anchorage, Alaska). New Hampshire's Ara Nazarian (Boxford, Mass.) potted three goals and one assist, including the game-winning strike in overtime to give UNH a 3-2 win. Boston College took a 5-3 win over UConn on Friday night, improving to 9-4-3 in league play this year. The Eagles take on Harvard in the opening round of the Beanpot Monday night at 5pm. Boston University and Northeastern compete in the 8pm game and both contests can be seen on NESN. Ty Farmer (O'Fallon, Mo.) registered the first multigoal game of his career in Friday's 7-5 win at Boston University. He netted the game-winning tally to lead UMass to its first road win over BU since 2012 and finished plus-three in the contest. Tyler Wall (Leamington, Ont.) stopped 26 of 27 shots he faced from #12 Northeastern on Friday night, earning a 3-1 road win for the River Hawks. 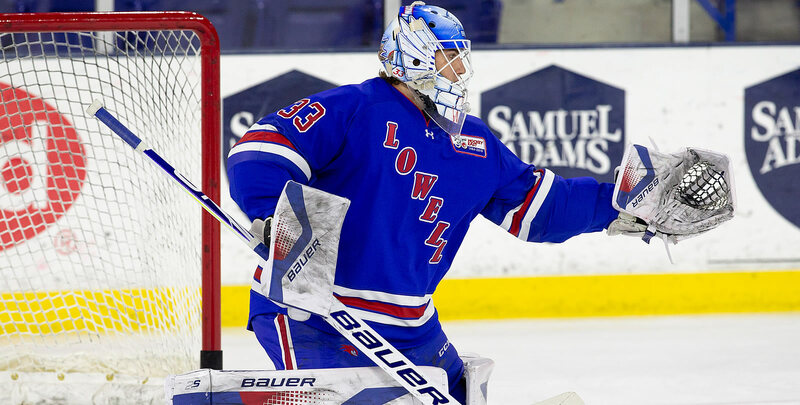 He helped UMass Lowell extend its unbeaten streak to eight games (7-0-1) and earn its eighth consecutive road win, the most for the River Hawks since 2013. 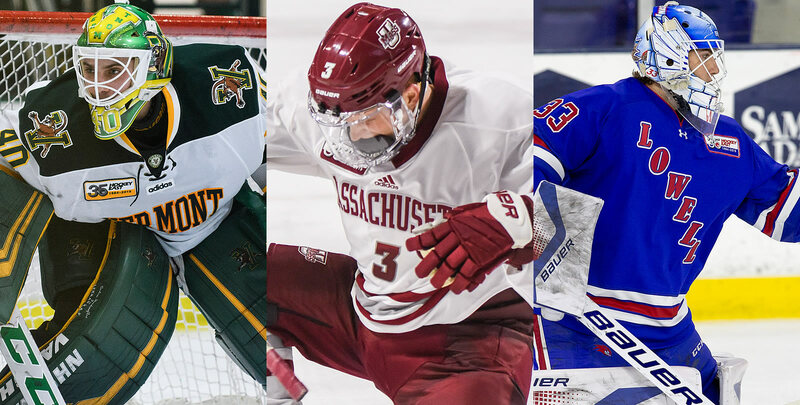 The 11 road victories on the year for UMass Lowell are the most in the nation. Patrick Curry, BU (Jr., F; Schaumburg, Ill.) Netted two goals on Friday against #3 UMass, pulling the Terriers even with the Minutemen with each tally. Joel Farabee, BU (Fr., F; Cicero, N.Y.) Picked up three points on a power-play goal and two assists on Friday against UMass. Dante Fabbro, BU (Jr., D; New Westminster, B.C.) Registered an assist and a career-high seven blocked shots in Friday's 7-5 loss to #2 Massachusetts. Mitchell Fossier, Maine (Jr., F; Alpharetta, Ga.) Scored two goals and recorded three assists for five points in a weekend split at New Hampshire. He scored two goals and had two assists in Saturday's 5-3 win. Jeremy Swayman, Maine (So., G; Anchorage, Alaska) Topped 30 saves in each of Maine's two games at New Hampshire, including stopping 41 in Saturday's 5-3 road win, earning a weekend split for the Black Bears. John Leonard, UMass (So., F; Amherst, Mass.) Logged his fifth three-point game of the year with a goal and two helpers to push UMass to a 7-5 win at Boston University. Mattias Goransson, UML (Jr., D; Slottsbron, Sweden) Notched a game-high three points (3a) in a 3-1 win at #12 Northeastern on Friday night at Matthews Arena, finishing with a plus-two rating and two blocked shots. Reid Stefanson, UML (Fr., F: Winnipeg, Man.) Scored his sixth goal of the season in UML's 3-1 road win at Northeastern. Ara Nazarian, UNH (Sr., F; Boxford, Mass.) Potted three goals and one assist in a weekend split with Maine at the Whittemore Center. He struck twice and dished out a helper on Friday, including the game-winning strike in overtime to give UNH a 3-2 win. Jackson Pierson, UNH (Fr., F; Zionsville, Ind.) Racked up four assists in a 1-1-0 weekend against Maine, including one on each Wildcat goal in Friday's 3-2 overtime win.